On September 15th and 16th the Edul@b research group welcomed Dr. Terry Anderson, Professor Emeritus at Athabasca University, who offered two seminars on topics related to e-learning. The seminar of September 15 entitled “Research Seminar: Theories for Learning with emerging technologies” was aimed at students and teachers of the UOC master and doctoral programs in Education and ICT (e-learning). In this seminar Dr. Anderson presented the theories that explain and explore the educational potential of web technologies and social networks followed by the different research paradigms that help shape the research about learning and teaching online. Special attention was dedicated to the pragmatic approaches and the design-based design. The seminar was held at the headquarters of the UOC at Tibidabo and followed online by students from Spain, the Philippines, the United States of America, Canada, United Kingdom, France, Serbia, Chile, Peru, Colombia and South Africa. This event had the collaboration of the Doctoral School and the UOC Master and PhD Programs in Education and ICT (e-learning). You can view this seminar recording and the slides in the following link. 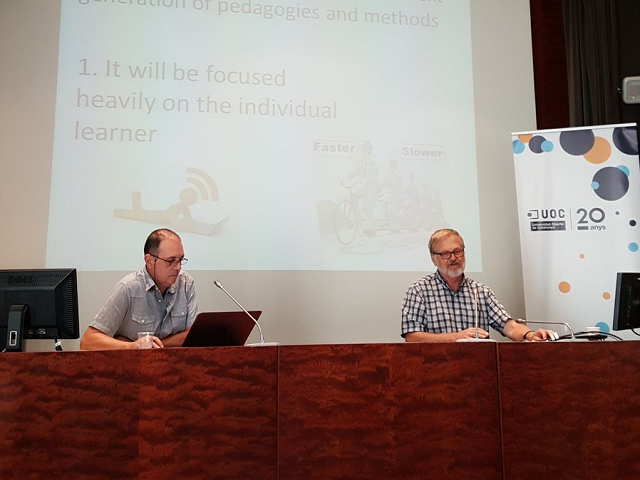 At the seminar of September 16 entitled “Open Seminar: The future of e-learning” were invited members of the community of professors from different universities of Catalonia. This event had the collaboration of the UNESCO Chair – Education and Technology of the UOC and the Agencia Catalana de Universidades Públicas (ACUP). This seminar, also held at the UOC headquarters at UOC Tibidabo, was also broadcasted online to participants mainly from Catalonia.